At the height of World War II, American Amity Mitchell is living a comfortable life abroad as a tutor in England. But that changes when an urgent telegram arrives from her brother, Andrew, summoning her to Prague. Andrew's efforts to help Jewish children escape Czechoslovakia have grown desperate as Nazi forces tighten their grip on the country. Amity knows she can't ignore God's call to join Andrew in coming to the children's aid. Amity's boss, Clark, follows her to Prague to urge her to return but soon finds himself helping the Mitchell siblings prepare Kindertransports bound for the safety of England while threats of German occupation escalate. As Amity and Clark race to save innocent lives, God is drawing them closer to each other. 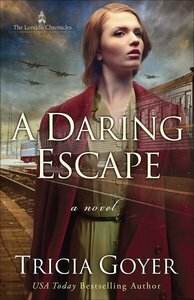 A Daring Escape is a gripping tale of hope, self-sacrifice, and the power of unrelenting love to overcome unspeakable hate. About "A Daring Escape (#02 in London Chronicles Series)"
Tricia Goyer has written hundreds of articles, Bible Study notes, and both fiction and non-fiction books, including From Dust and Ashes, Night Song, Arms of Deliverance, and Generation Next Parenting. She was named Mount Hermon Christian Writers' Conference "Writer of the Year" in 2003. In 2005, her book Life Interrupted was a finalist for the Gold Medallion and her novel Night Song won ACFW's Book of the Year for Long Historical Romance. In addition to writing, Tricia enjoys sharing Jesus' love through volunteering as a mentor for teenage mothers in her community. She also joins the rest of her family, leading children's church every week, and travels throughout the United States as a speaker, mainly giving presentations to women's groups.